The ELGS internship program is a dedicated program for the students and alumni of its higher education institution. The program serves as a bridge between the academic community of the ELGS and the EPLO system, and the opportunity it offers, aims at strengthening the application of knowledge and the development of the student’s skills, assisting them in their passage from the educational to the professional world. Rooted in the belief that practical experience is necessary to ensure the application of theoretical knowledge and also to bridge students’ passage from the educational to the professional world, the ELGS offers a unique internship placement program through the schools’ cooperation with various partner organizations, such as the World Bank. In accordance with each student’s academic program and career objectives, they will work closely with the ELGS’ internship placement coordinator to ensure that they make the best selection possible and gain the most from their experiences. 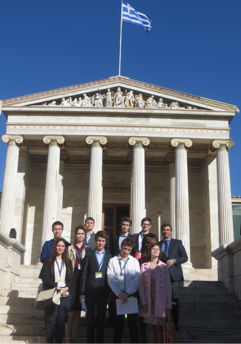 Through this program, the EPLO offers internship opportunities for the ELGS students and graduates to undertake at its premises in Sounion, Greece, where the ELGS is also hosted, and or possibly at its branches in Bucharest, Chisinau, or at its regional offices in Brčko and Skalica. The internship is designed to enhance the students’ educational experience gained through the ELGS with practical work experience, to familiarize them with the work of the EPLO, including its structure, objectives and activities, and to help students further develop their professional and leadership skills.